Sunset over Lane Stadium. The Virginia Tech Hokie colors in the Blacksburg sky play against a packed house and Lane Stadium. Home of the Virginia Tech Football and the Hokie Nation. 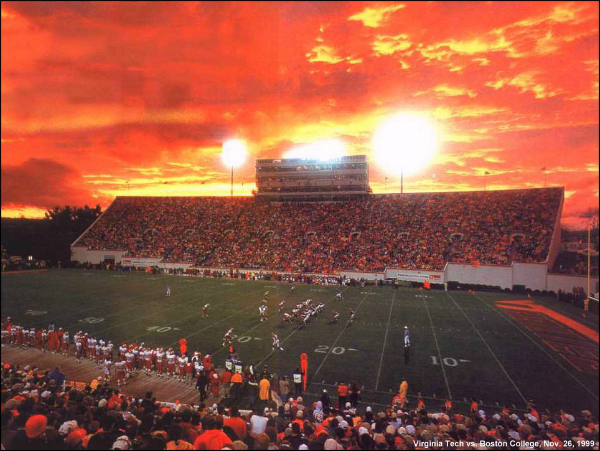 This is the famous sunset picture from the 1999 Boston College game, the day that Virginia Tech clinched their undefeated season with a 88-14 win on November 26, 1999. Lane Stadium (Worsham Field) is a football stadium located in Blacksburg, Virginia. It is the home field of the Virginia Tech Hokies football team. It was rated the number one home field advantage in all of college football in 2005 by Rivals.com. It is also ranked #2 on ESPN.com’s “Top 10 Scariest Places To Play.” Lane Stadium is located at the highest elevation of any Division I Football Bowl Subdivision school stadium in the eastern United States, at 2057 feet above sea level. Starting in 2004 expansion began to add new boxes include a new press area, on the side toward the south end zone, with a dining area and improved facilities. Also, the fencing that surrounds the stadium was removed, and the area on the west side exterior of the stadium landscaped with walkways and a weekday parking lot for ticket patrons and Hall of Fame and Hokie Club visitors. New luxury suites, President’s area, four private club seating areas, concession stands, ticket office, athletic fund offices, an Athletics Hall of Fame and student academic services area were also included in this latest project. A two tier grandstand featuring 11,000 seats, 15 luxury suites, and a new visitor’s locker room was completed. The $52.5 million expansion includes 23 luxury suites, a new pressbox, and club seating. The addition increased Lane Stadium’s seating capacity of the Hokie Nation to 66,233.